Coupons are a great way to generate sales and reward frequent customers. And with Ascend, coupons are easy to create, share with customers, and redeem. 1. From the Ascend desktop, select View > Payment Types. 2. Select the Coupon payment type from the list. Your existing coupons display in the lower part of the screen. 3. Select the Add icon from the lower part of the screen. 4. 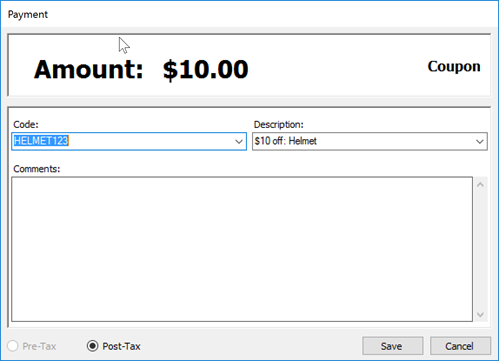 Fill in the Description field with the new coupon name. 5. Enter the amount in the Value field. 6. Then select a Start Date and End Date for this promotion. 7. The Code field auto-populates when you enter a description, but you can easily change it if you want to use your own custom code. You cannot use an existing code (from another coupon). Sherpa tip: Codes can be up to 20 numbers, or up to 14 alphanumeric characters. 8. Post-Tax is selected by default, but you can change it to Pre-Tax if needed. You state or locality sets the tax laws, so check with your accountant before making this change. Sherpa tip: Pre-tax coupons must be applied to the sale before non-coupon payments are taken. Post-tax coupons can be taken at any time during a sale (even if the customer has already made a payment). If you're a multi-store retailer, coupons are automatically shared across all your locations. If a location does not plan to honor this coupon, have them open the coupon and uncheck the Honor Coupon box. Then click Save. If you build your own digital marketing campaigns, you can easily copy or print the coupon barcode. 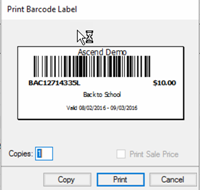 Highlight the coupon and select the Label icon in the middle of the screen to open the Print Barcode Label window. Click Copy if you want to copy and paste the barcode into a digital campaign (like an email). Otherwise, set the Copies field to the number of labels you want, and click Print for any printed materials (like flyers or postcards). Interested in how successful your coupon marketing campaign has been? Check out this report. 1. From the Ascend desktop, click Reports. 2. Scroll to the the Payments section on the left. 3. Double-click the Coupon Use History report. 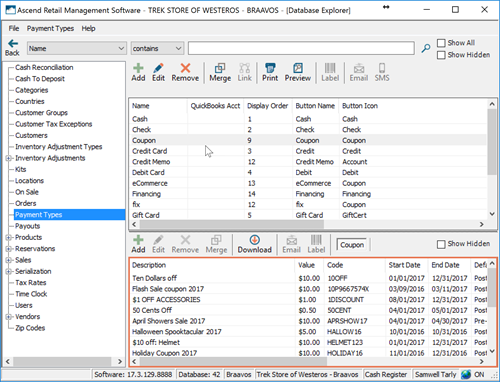 This report shows data from all your coupons, or from a specific coupon code, depending on what you choose in the Filters popup. Once a customer is ready to pay for their items, check if they have any coupons to apply to the sale. 1. Select the Coupon payment type. 3. If you cannot scan the coupon (which might be the case if it's on a phone screen), you can select it by Code or Description. The coupon is applied to the sale. Coupons can only be used once, so if it covers more than the cost of the item, the "leftover" amount is lost. If the coupon does not cover the full balance, the customer will have to pay for the rest of the transaction with another payment type. If you have a barcode scanner capable of scanning drivers' licenses (a DS4308-DL, a DS6878-DL, or a DS8178-DL), you can scan coupon codes directly on a customer's phone!